Want to Help your Dog? Start by Helping Yourself. Has anyone ever told you that you and your dog resemble each other? It might not be your similar physical characteristics (or maybe it is) but that you’ve started expressing some of your pup’s qualities. As you know, the human/canine bond is strong and deep. We become so intertwined that we often mirror each other in physical and emotional ways. These reflections are directions leading us to enhance our own lives and the lives of our canine companions. At Sama Dog, we see examples of this regularly. Animals appear showing the same symptoms and suffering the same allergies, digestion issues and mood disorders as their parents. Shared physical symptoms are often attributed to a shared environment and lifestyle. If you don’t get much exercise, chances are neither does your dog. If you eat unhealthy food, it’s likely your dog could also benefit from more freshness in their meal. This reflection can also serve as a reminder to start making yours and your dog’s health a priority. What are not as easily recognized are emotional mirrors. A recent study by the University of Vienna, confirms our own experiences finding, “Empirical evidence about dogs’ sensitivity to emotional states in humans is accumulating”. They label this dog empathy ‘emotional contagion’. This is no surprise to dog lovers. We could probably all tell a few stories of our best friends comforting us during difficult times or refusing to leave us while we are ill. Now, there’s scientific evidence to validate what we’ve been experiencing. Another study reported physical evidence of cortisol levels rising in dogs that hear a baby’s cry compared to white noise or a baby babbling. Empathy at its finest. One of the best parts of sharing your life with a dog is seeing each other grow and continue to learn. Whether you’ve been together one day or 10 years, there is always more to discover and ways to deepen your relationship. Every effort serves your furry friend and you. The more we learn about them, the more we learn about ourselves. A recent example of this was a pooch who came to Sama Dog with bouts of anxiety and nervousness. 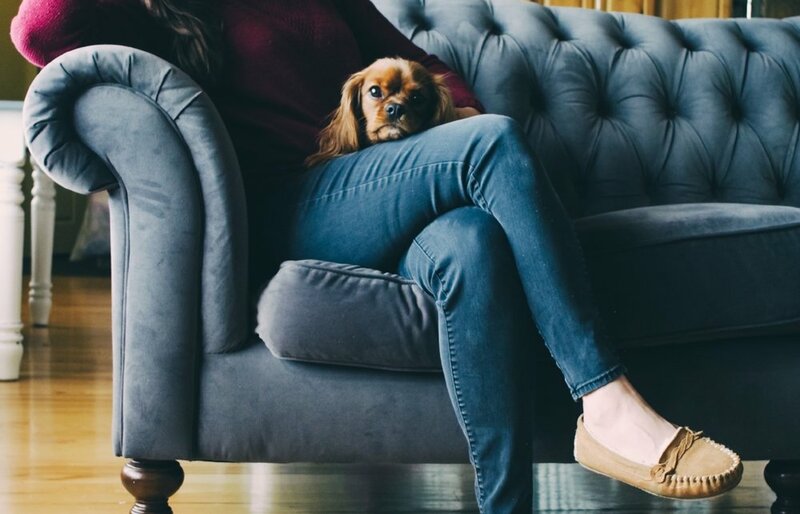 His mom asked earnestly, “How can I calm my dog?” not knowing that her four-legged friend was shining light on the answer by mirroring her own anxiety. She held the key and we discovered the real question was meant for her, “How do I calm myself”. It is often that simple. Connect, remain present, and ask yourself, “What is my loved one showing me?” There are physical signs and clues in their behavior that show up as a way to help improve both of your lives. Here’s the message: when your pooch is having issues of any kind (behavioral, physical, mental) start with yourself. Heal yourself to heal your friend. Consider signing up for a free 20-minute consultation with me to better understand where you and your dog may be mirroring each other, and advice on how to improve it.